Imogen's Typewriter. 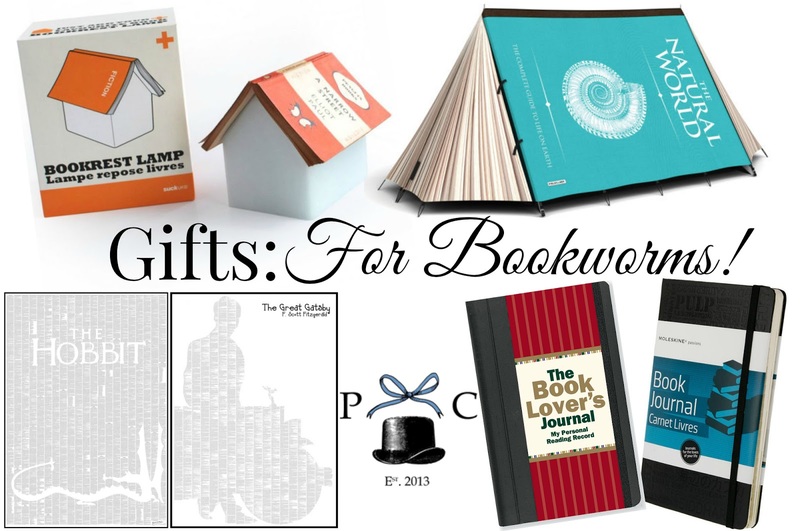 : Gifts: For Bookworms! For me, the hardest people to buy presents for are bookworms. I know they like books. I know what kinds of books they like. But I know what kinds of books they like because they already have those books so unless I'm told explicitly "I want this book by this author," then I have to think a little outside the box. These are the five gifts for bookworms I've found! Last year I got my dad the Bookrest Lamp (£36.99) from I Want One of Those and he loves it. He says it's the best gift I've ever got him (no pressure for this year eh?). This lamp is house shaped and is designed for the bookworm to rest their book on, while saving their page. I honestly think I'm going to buy one of these for myself one year. If your bookworm is also a camper, or likes to read in the great outdoors then this Fully Booked Tent is so cute! It's a bit pricey (£189.99) but I couldn't not show it. It fits two, has the cover of The Natural World and opens at the pages. Another gift idea is the Spineless Classics posters (£24.99-£44.00) that use the words from the book in the shape of instantly recognisably imagery from the story. They have a wide variety of books to chose from; The Great Gatsby, Alice in Wonderland, James and the Giant Peach, Pride and Prejudice, Trainspotting, Wuthering Heights and Life of Pi. And there are a couple more on Amazon if none of those take your fancy too. Personally I think these are so classy and prefect for if you know they like a book enough to want it up on their wall. I couldn't do a gift idea post without mentioning a subscription service. I think they're such a lovely gift because they continue on for a couple of months and give the receiver something to look forward to in the bleak new year. And the one I love is Prudence and the Crow, a vintage book subscription box at £12 a month that offers 1, 3, 6 and 12 month subscriptions. I got a 3 month subscription for my mum for her birthday this year and she was really excited every month when it popped through the letterbox. Each package comes beautifully wrapped with a vintage paperback and a few extras. Lastly, another thing something my dad and I both have is the Moleskine Book Journal (£12.59) for keeping track of what we've read and what we thought of it but while looking for this, I found this Book Lover's Journal that seems pretty neat too and is a little bit less expensive (£10.06). Book Journals are so handy to have for readers that maybe don't have Goodreads or maybe just like writing things down! I use mine for recording quotes and amazing writing I find as I read. What do you get for the bookworms in your life?